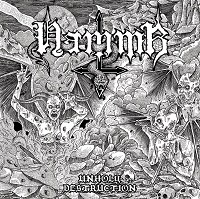 The American Black Thrash game continues, ABSU have lead the line for so many years, now it’s time to hear what HAMMR can do, this is his first Full-Length album after unleashing their self-titled EP back in 2015 and then the Demo “Into The Pentagram” in 2016. That song is now on this album. “Satanic Raid” has the dark sense of older Absu, mixed with the heavy layer of Thrash from SLAYER. It’s a return to the dark days of Thrash. The melody has a “Seek and Destroy” sound in there, but keeps it ticking over well with the low cut vocals in short outbursts. A decent solo is helping keep the song going nicely, the edgy clean cut styles met with J’s dark growls. If you like dark and edgy thrash then this is for you. “Sadistic Poison” starts once more like a Toxic Holocaust song, this time the start off has a lot more to offer from the vocals. Something that has been previously missing. The vocals aren’t in any real lyric depth but they last throughout the song, to give the album itself a pick up. The Thrash Death Metal sound is running true via the instruments here too. This is a great mix of vocal and melody. “Death Reign” has the thick sludge style Thrash that you are used to hearing more with MUNICIPAL WASTE. The vocals are in full force again for this half of the album. The sound is less Black Metal and more Death Metal mixed with Thrash, but it has both a good sound and feel to it. It isn’t a long song, but none are here. It has a decent Thrash-Attack vibe.